Perhaps not the end, but we’re close enough to smell the corpse. While Windows Phone platform isn’t dead yet, with Huawei Windows Phone already a memory, you have got to wonder how long Microsoft will hang on. Aside from Nokia, which Microsoft owns, Huawei was one of the biggest and highest profile OEMs producing and selling Windows Phone smartphones. No more. ComputerWorld, quoting comments from the head of Huawei’s consumer business group, reports that the Chinese networking and wireless equipment and device maker no longer make or sell Windows Phone smartphones. Two years of losses that reportedly hit $2 million or more per month. Ouch. And, what a great time for Huawei, which purportedly has ties to China’s military and thereby government to ditch Windows Phone. Say what? The Chinese government is “investigating” Microsoft for monopolistic practices (aka playing international power politics by other means), including a real throwback to the 1990s — bundling Microsoft Internet Explorer with Windows. Hey, China, the ’90s called to tell you that both Bill Gates and Steve Ballmer have left the building. At the very least, Chinese prosecutors should come up with plausible fig leaf, really. 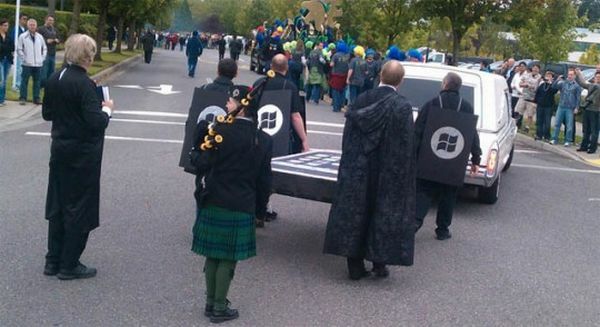 Editor’s Note: Yes, the above photo shows Microsoft’s September 2010 funeral for Blackberry and iPhone, included here for dramatic irony.